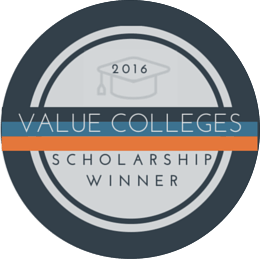 Value Colleges is proud to present the winner of our 2016 Me First! 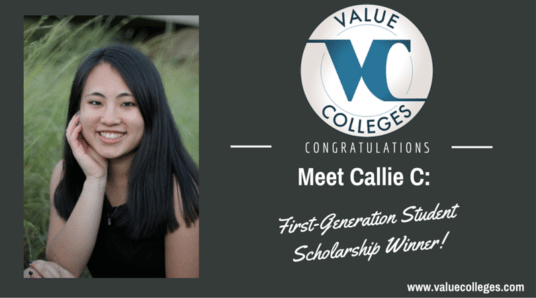 Scholarship for First-Generation College Students, Callie C! Value Colleges exists to guide prospective students to the most financially responsible choices for a college degree, helping budget-conscious people pursue their dreams and avoid the nightmare of life-long debt. Callie’s essay immediately stood out, partly because of its solid, thoughtful writing, but especially because Callie’s dreams stand for the dreams of all first-generation students. When her birth family in Vietnam allowed Callie to be adopted in the United States, they gave her more opportunity than they could have imagined. With the support of her single mother and her own resilience, Callie is making the most of that opportunity the way countless brave immigrants, adopted Americans, and first-generation students have done in the past. In her essay, Callie wrote, “College is a gift you give yourself,” but by pursuing her best self, Callie is giving a gift to everyone. Congratulations to Callie, who stands as an inspiration to other young people. It’s a small award, but it’s a step into a future led by a smart, courageous generation that knows the value of hard work and high hopes.